Step 1 - determine if your system is running the 32 or 64 bit version of Windows. To find out if your computer is running a 32-bit or 64-bit version of Windows in Windows 7, click the Start button, right-click Computer, and then click Properties. Under System, you can view the system type. 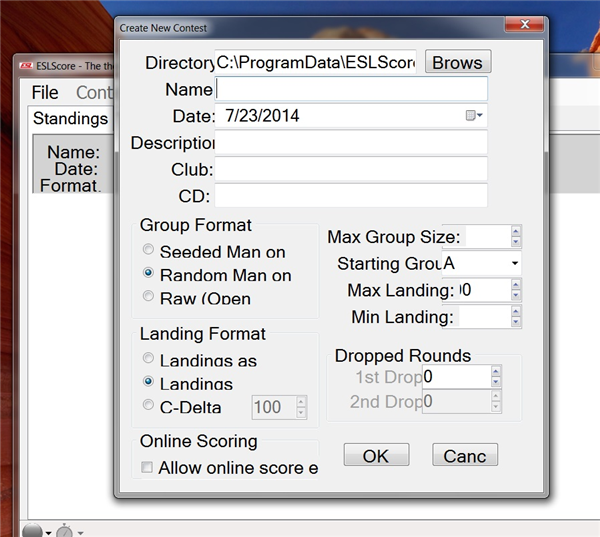 Can pilot lists and contest scores created and scored in version 1.x be shared back and forth with those in 2.x? We have an XP laptop as the main computer but would like to have a backup computer that happens to be running Windows 7. Any .ESLScore file from an older version can always be opened by a newer version. So, the latest version can always open a file created by an earlier version. The reverse is not true. Using an 'out of date' version to open a contest file that was created with a later version is not supported. Unfortunately, the software does not check for this condition and the results are unpredictable. A backup computer for a contest is a good idea, as is keeping a binder with printed copies of the results of each round (just in case). I downloaded & installed ESL 2.x on our clubs scoring computer and although it runs I'm experiencing a weird graphics issue. Screenshot attached. The labels in the GUI windows overlap the drop downs adjacent to the labels. Any thoughts on what might be causing this issue? I've changed the screen resolution with no luck. Windows 7, 32 bit. Unfortunately, ESLScore doesn't do a good job with non default font sizes which looks like what may be your issue. Check out http://www.pcadvisor.co.uk/how-to/windows/3327418/how-make-text-appear-bigger-or-smaller-in-windows-7/ and set it to 100 percent in step 3. No worries, that fix did the trick. I appreciate your help and look forward to the ALES contest next weekend. Version 2.08 was released today and can be downloaded from the first post in this topic. Version 2.11 was posted today. See initial post for download link. Fixes winch assignments for previewed groups.